Anymore, thereʼs so many people walking around who donʼt even seem to think. At the grocery I gave the bag boy the fabric freezer bag I always take to the market so the food will stay cold on the way home. And you know what he put in it? The bananas and cheese! He put the milk in a regular bag, and itʼs the most likely to spoil. And then when I got home I was tired so I only put away the perishables. The next morning when I was finishing up I found heʼd put a package of frozen fish in with some canned goods. It sat out all night. I hope it will be all right. Weʼll have it for dinner tonight. 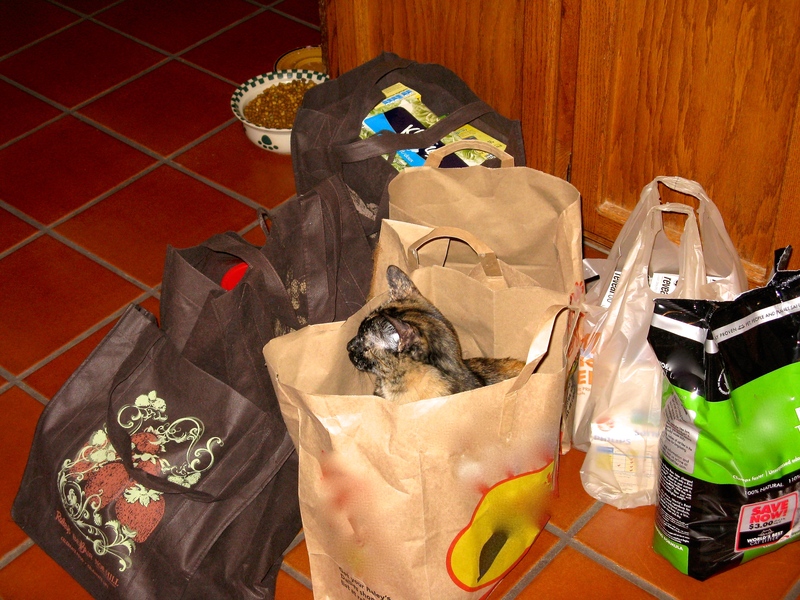 The grocery bagger might put things in the wrong bags, but the cat never does. Tags: cat, grocery bag, shopping. Bookmark the permalink. trust cats to know what to put in a bag!